A lady from Damascus told me we each have dual nationality: our birthplace and then Syria. Recent studies of DNA inheritance suggest this is indeed true. Our ancestors lingered on Syrian soil for extended periods before moving to inhabit the far reaches of the world. The “oldest inhabited city on earth” has once again become the focus of bitter fighting and the Syrian crisis has awakened our ancestral memory, if not our historical one. 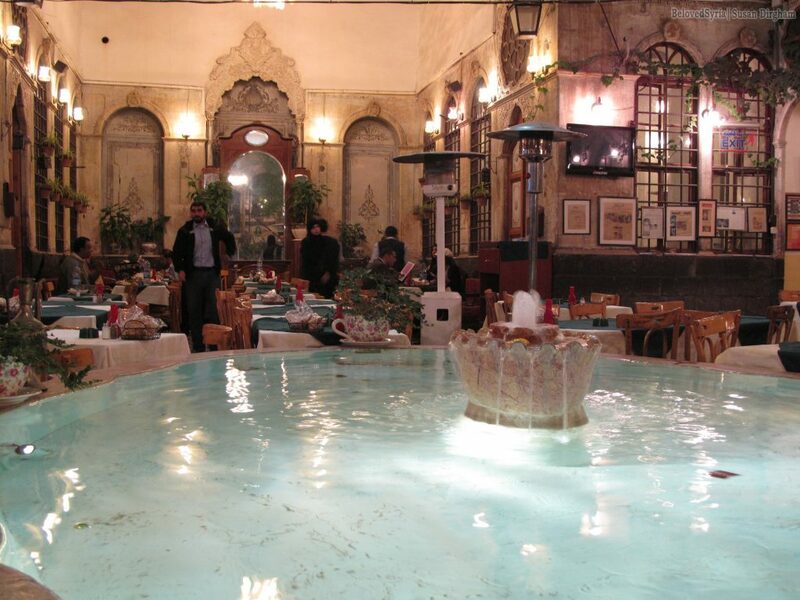 Damascus has fallen so many times, only to rise again bearing its exuberant style proudly. This book, so lavishly illustrated, is a portrait of the architectural and decorative innovation of old Damascene palaces and of some of the people who inhabited them. Photographs of courtyards, ceilings, wall paintings, coloured paste work, stonework, windows and doors are grouped in chapters, while the narrative weaves its way through human extravagance and its results. Notwithstanding the deprecations of time and venality, there is a lot that still sparkles with timeless verity. According to legend, the Prophet Mohammed, who approached Damascus through the mountainous desert, stopped in his tracks when he saw the shimmering white city in the green oasis, saying “man should only enter Paradise once”. It was of course a Christian city at that time, having adapted the Roman temples into churches, leaving little trace of Aramean temples of Biblical ancestry. 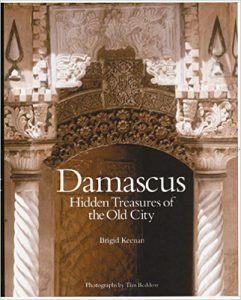 Within years of the death of Mohammed, the Arabs invaded, and Damascus became the fourth holiest city of Islam. The Great Mosque of Damascus (or the Umayyad Mosque) was the focus of the new religion. The mosque was built on the site of a temple dating back to the 9th century BC. The Grand Mosque to some extent incorporated temples and a Christian basilica dedicated to John the Baptist. 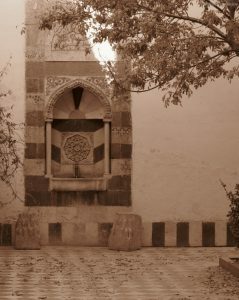 Ancient walls and columns either within the mosque’s structure or in its shadows attest to the extraordinary history of Damascus. The Umayyad Caliph, Al-Walid (who ruled from 705 until 715), ploughed a fortune into the construction of the Grand Mosque to leave no doubt in the minds of Damascenes about the superiority of Islam with its sumptuous marbles, gold, mosaics inlaid with agate and turquoise. It was said one prayer said there was worth 30,000 said anywhere else. 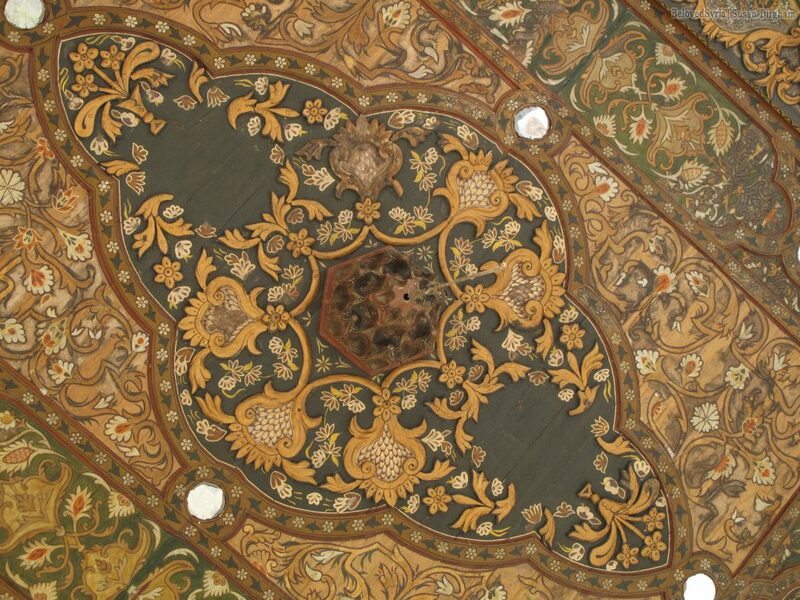 It was to Syrian and Greek craftsmen that Al-Walid turned since they had honed their skills in Byzantine churches. With the exclusion of the human form in Islamic art, however, they turned their creativity and invention into abstract geometric and serpentine extravagance, engendering visions of Paradise as described in the Arabic nights. And so a culture was constructed about the perfect indescribability of God or Allah, which could be best communicated by dizzying patterns and energetic fruiting vegetation. The buildings of Damascus has generous proportions of mathematical stability to contain the decoration, bringing man face to face with the perfection of Allah. The same elements were enthusiastically used in palaces, where their more secular intent was nevertheless infused with the harmony of the mosque. It is a humbling thought that we all share this instinct for balance within profusion, through our Syrian DNA.